My daughter, Manami, went back to school after a week vacation. During the week, she seemed to miss the classes, teachers, and friends. 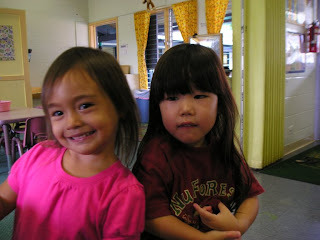 The school started a new semester from last week, and Manami got a new teacher, Ms. Amy. 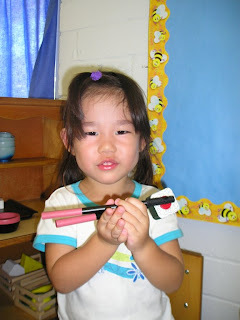 She is so great, beautiful and attentive that she sent us parents some photos of Manami at her class. We feel very happy to look at them. Let me share those photos with her comments. 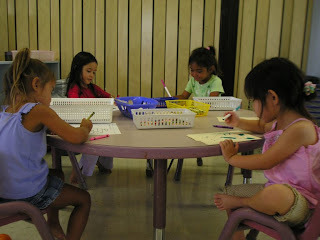 Here, Manami is working with Summer, Gianna and Taisha at the writing center. Manami was interested in the play sushi in the home center. We are trying to incorporate things from the Japanese culture into our class. We have kimono and Japanese style food and dishes. We also have some books with Japanese writing and music with both English and Japanese words in our listening center. We want Manami to know that her culture is important and that she truly belongs in our class. Manami is trying a puzzle. She was able to complete it, and she can identify numbers in English. Manami likes to work independently and with friends. She was working on puzzles with Kawehi. Here is Manami with Jalei. This was taken a few weeks ago in Ms. Lois' class. Jalei is still in the 3-year-olds' class, so we don't get to see her very often. She and Manami got along well and used to sit together at lunch. Manami is only the Japanese at the school, however, she now enjoys attending classes in English, which I believe will make her huge benefits in the future.